The previous frames of the input clip are processed with a pixel diffusion process and then combined with the current frame. The output of each processed frame is stored and then combined with the next frame. The trails are reinitialized whenever a non-consecutive frame is processed, either the first frame, reprocessing a given frame, or jumping to another frame. You must process multiple frames of a clip in a row to observe the effect. 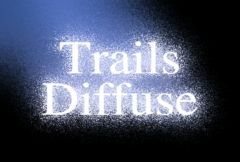 Diffuse Amount: Default: 0.05, Range: 0 or greater.